Duluth, Georgia (Aug. 21, 2014) — AGCO Corporation (NYSE:AGCO) introduces the 2015 Massey Ferguson® 9505 Series and Gleaner® S8 Super Series combines at the 2014 Farm Progress Show in Boone, Iowa, August 26–28. Upgrades to each of the unique harvesting platforms meet farmers’ evolving needs for a variety of crops and conditions. The 9505 Series machines are designed for cleaner harvesting by joining Massey Ferguson’s proven TridentTMprocessor with a new variable-speed hydraulic-drive fan, which is adjustable from 100 to 1,350 RPM. The extended fan-speed range eliminates the need to switch pulleys to adjust for various crop types, and provides excellent performance while harvesting grass seed and canola. Up front, the 9505 Series combines have a variable-speed header drive with heavier-duty components to match the machine’s new power ratings. The new drive system is more durable, so farmers spend less time on repairs and maintenance, all while providing more than 28 percent more power to the header. This system is perfect for running larger corn and chopping headers. The 9505 Series has the field-proven V-CoolTM cooling system, which provides improved engine-heat rejection by positioning the radiator, hydraulic-cooling heat exchangers and the air-to-air intercooler in a V-shaped design below a variable-speed, hydraulically driven fan. Fan speed varies according to conditions, so the fan only draws as much power from the engine as needed, increasing fuel efficiency. The V-Cool system also includes a “purge” cycle that reverses the fan to clear off chaff and other debris, which keeps the engine running and reduces the need to stop and clean the system. For more information on Massey Ferguson products, visit www.masseyferguson.us or contact your local Massey Ferguson dealer. All three combines can be equipped Ag Leader–ready as a factory option that allows for yield monitoring with a live yield map. The kit includes an elevator mount unit, yield sensor, moisture sensor, speed module and harness. Farmers need only add the Ag Leader display of their choice. AGCO Corporation (NYSE:AGCO) is a global leader in the design, manufacture and distribution of agricultural machinery. 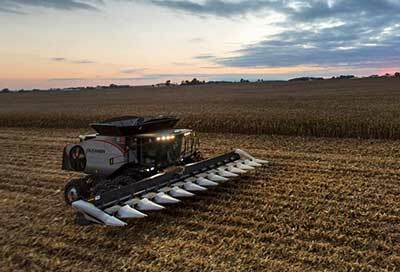 AGCO supports more productive farming through a full line of tractors, combines, hay tools, sprayers, forage equipment, grain storage and protein production systems, tillage implements and replacement parts. AGCO products are sold through five core machinery brands, Challenger®, Fendt®, GSI®, Massey Ferguson® and Valtra®, and are distributed globally through approximately 3,100 independent dealers and distributors in more than 140 countries worldwide. Founded in 1990, AGCO is headquartered in Duluth, GA, USA. 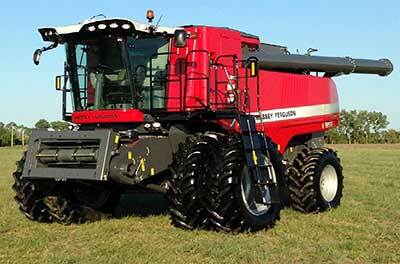 In 2013, AGCO had net sales of $10.8 billion. http://www.AGCOcorp.com.